As my readers may know, I am a huge proponent of pet adoption. All of my companion animals are rescues. 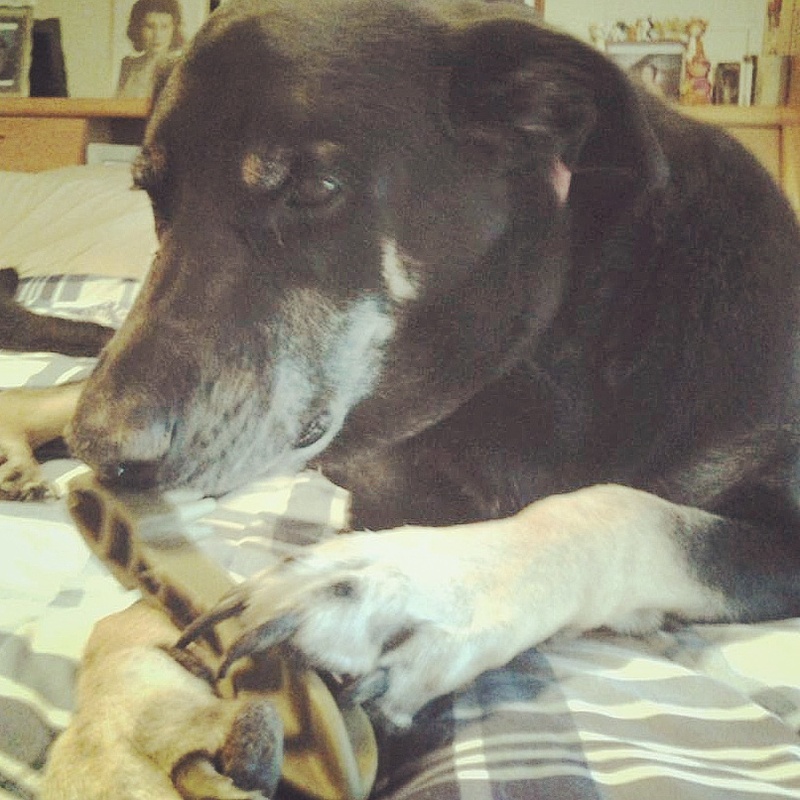 Back in 2007, I adopted my dog Banksy from the Albuquerque pet shelter. She lives with my mom now along with her best friends Penny, Sadie and Bandit. (And those are just the dogs! Banksy loves the cats, too!) When I adopted her, Banksy was just a small, clumsy puppy. She’s all grown up now, and she’s a HUGE dog — almost 100 pounds! Part Doberman, her adoption papers indicated that she would grow to become pretty big, but that’s exactly what I wanted! Every day I’m grateful that I found her. I miss her, and every time I go home to visit my family I am overjoyed to see her. And judging by her reaction when we reunite, I think the feeling is mutual! John is a great example of a dog who is waiting for his “furever” home at the ASPCA! But sadly, dogs like Banksy – big dogs, especially black ones – don’t have it easy in shelters. Large dogs are often overlooked because most people prefer puppies, and many larger sized dogs like Dobermans have been profiled as dangerous, scary or unpredictable (or all three). There is even a phenomenon called Black Dog Syndrome, which is when dark dogs are adopted less often than lighter colored ones. Negative stereotypes of large breeds, coupled with the idea that a puppy or a smaller dog is better, has resulted in many amazing dogs wallowing in shelters. So, promoting the adoption of frequently overlooked dogs is really important. Which brings me to the #BigLoveCampaign! Have you heard about it? 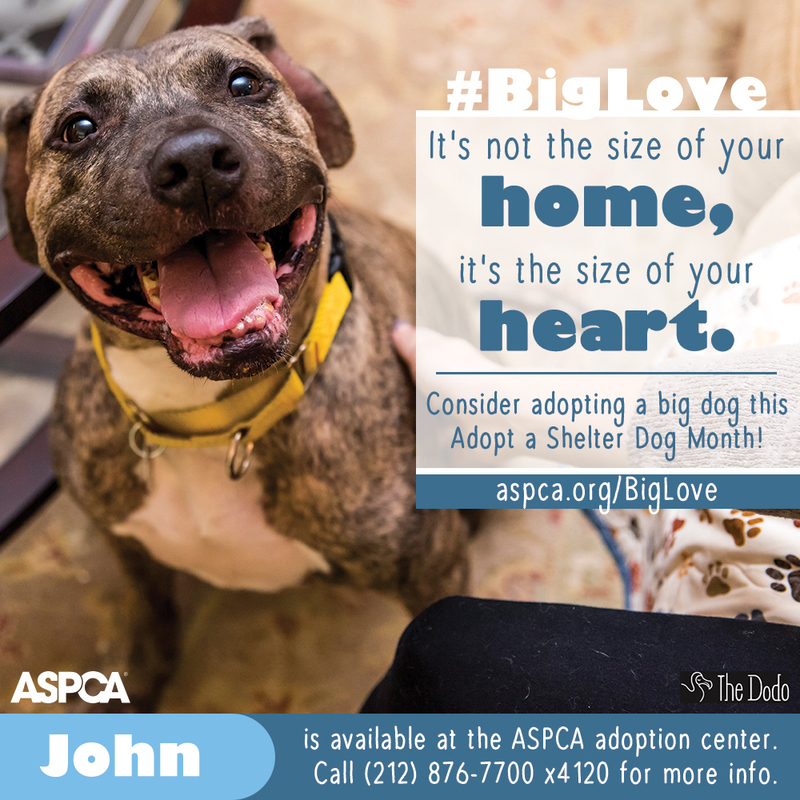 This year, the ASPCA is encouraging folks to consider adopting a big dog by running the #BigLove campaign which will help bring attention to adoptables during this special month. The campaign centers around the idea that it’s not the size of your home, it’s the size of your heart that matters. Do you already have a big dog that you love? There’s a contest, too! The ASPCA has also joined forces with Animal Planet to celebrate shelter dogs. By sharing the cutest photos of their shelter dog at www.aspca.org/MyRescueDog, folks will be entered for the chance to have their photo featured on the October 17th episode of Pit Bulls and Parolees and win prizes. In my opinion, this campaign is a great way to educate others about the importance of adopting their next companion animal, and also to help de-stigmatize larger sized breeds (especially pit bulls). Don’t get me wrong: I love small dogs (two of my mom’s dogs are chihuahuas! ), but large dogs are more often discriminated against in the form of breed-specific legislation and housing restrictions. With October being Adopt a Shelter Dog Month, it is a great time to raise awareness about a much neglected issue and share some big dog love! Please share the campaign with fellow animal advocates. And I’ll be looking for your #BigLove tweets to RT! What: This is a TREMENDOUS opportunity to find a LARGE dog for a SMALL price. All dogs over 30lbs will have their weight subtracted from the standard adoption fee, the bigger the dog the bigger the savings! For example, Hazel the pitbull has an adoption fee of $75, but when you subtract her 57 pounds, you pay only $18 for a lifetime of love and loyalty. Big Bonus: All animals, cats and dogs, are spayed/neutered, fully vaccinated, and microchipped. All dog adopters will go home with a free collar, leash, and ID tag, along with a voucher for a free visit to the ASPCA Animal Hospital. Cat adopters are sent home with a free collar, ID tag and cardboard carrier. 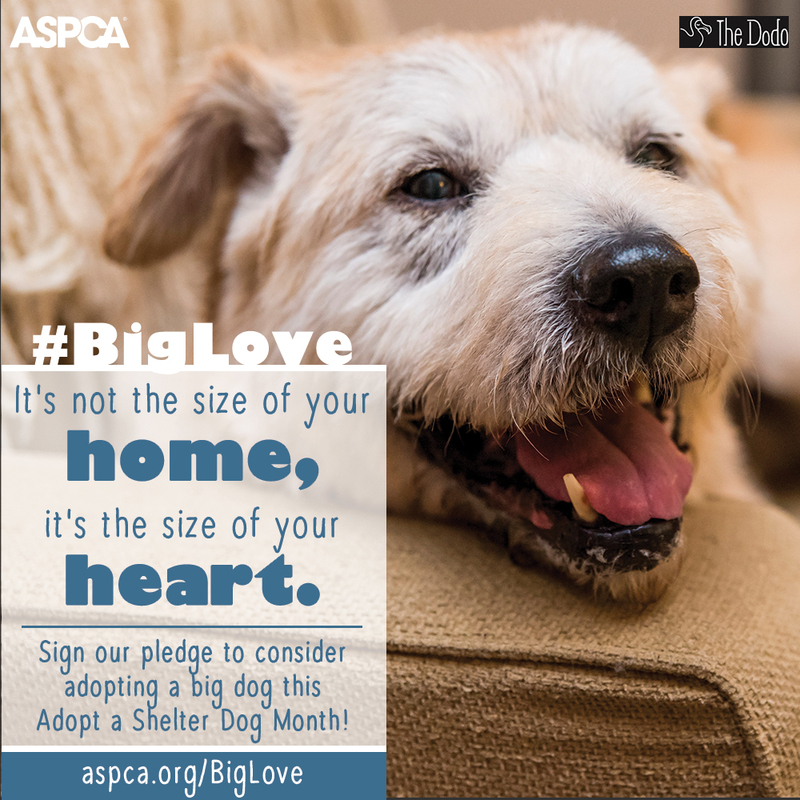 Please download and share these images across social media to promote the #BigLove adoption event! UPDATED! With information about the ASPCA’s month-long #BigLove adoption event!